Our software will help the hospital gain insight into the statistics and figures, ultimately allowing them to measure clinical impact and value 3D printing is having for patients. University Hospital Basel, a leading medical center in Switzerland, and award-winning UK medical 3D printing firm, axial3D, have formed a new alliance to deliver improved patient care and enhanced process management at the hospitals’ 3D print lab through axial3Dassure, a new 3D printing platform. Using axial3D’s cloud-based 3D printing platform, axial3Dassure, the University Hospital Basel aims to optimize and transform its medical 3D print lab facility, delivering an enhanced level of patient care and improved lab performance. The hospital will use axial3Dassure – a 3D printing platform, to manage quality control, communication, tracking, and workflow management across the facility, which is made up of over 20 desktop and industrial 3D printers. axial3Dassure will enable University Hospital Basel to improve productivity and compliance, and increase efficiency. The hospital will benefit from faster creation, processing, and delivery of 3D printed surgical guides. The 3D printing platform will support collaboration within the facility, with task-driven workflows and email notifications. Daniel Crawford, CEO, and Founder at axial3D said, “We are very excited to be working with the team at University Hospital Basel. They are a leading force in medical 3D printing, not just in Europe, but globally, and this alliance will ensure the expertise they have developed can support our company’s growth by informing the ongoing development of axial3D’s software solutions. With a growing requirement for 3D printing within healthcare, a centralized management platform is necessary for any 3D print lab, which plans to scale and grow in the coming years. University Hospital Basel has taken strides in its commitment to improving outcomes for patients through technology advances in the form of this collaboration. About University Hospital Basel (USB): The University Hospital Basel (USB) is one of the leading medical centres in Switzerland with a high internationally recognized standard. The interdisciplinary 3D Print Lab at the University Hospital Basel produces realistic anatomical models and other 3D objects from patient image data with numerous materials and printing technologies. 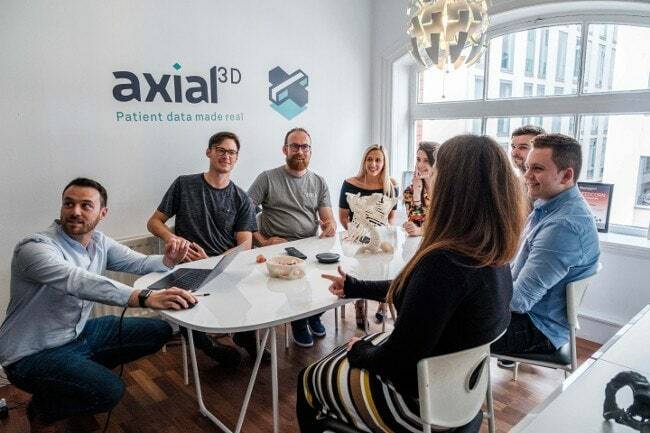 About axial3D: axial3D is a pioneering UK based medical 3D printing company specializing in the use of patient-specific medical models to advance both standards and efficiency of surgical intervention.